I recently finished a wonderful book titled The Idea Factory: Bell Labs and the Great Age of American Innovation, by Jon Gertner; New York: Penguin Press, 2012. For those of you like me who are curious about the modern world in which we live, but not necessarily scientifically oriented, don’t hesitate to get a hold of this book. I loved it. The sheer talent and amount of genius that existed at Bell Telephone Laboratories, Inc. in the 20th century is mind boggling. Nicknamed “Bell Labs,” this organization was the research arm of AT&T before AT&T was broken up. Much of the work was done about 30 miles west of New York City at a place called Murray Hill in New Jersey. The men and women who worked at Bell Labs during its golden era deserve to be more widely recognized for their contributions to mankind. The work that went on there literally changed the world. It was a twenty-something mathematician and electrical engineer named Claude Shannon who joined Bell Labs during WWII to help find ways to break enemy codes and develop technology that would intercept and destroy incoming fire before it reached its target. There is no doubt that these projects saved many lives. Shannon was pure genius and was a “founding father” of sorts. His master’s thesis, A Symbolic Analysis of Relay and Switching Circuits, written while he was a 21 year old student at MIT, is considered by some to be one of the most important master’s theses of all time. In 1948 Shannon’s paper A Mathematical Theory of Communication was published in the Bell Labs Technical Journal and took the scientific world by storm. His theories revolutionized human communications and it is why he has come to be known as the founding father of Information Theory. 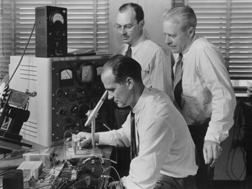 It was John Bardeen and William Brattain working under the direction of William Shockley at the lab that brought the first electronic transistor to life in 1947. It was an invention which made the electronic age possible and thus revolutionized the world. Their story of collaboration, success and betrayal is excellently told by Gertner in this book. The reader will also learn about the great Bell Labs scientist John R. Pierce, who Gertner dubs the “instigator.” Pierce had a knack for motivating his colleagues to push the boundaries of science and innovation. It was Pierce who helped create Telstar1, the first active transmission satellite to be launched into Earth’s orbit. Another figure who looms large is Mervyn Kelly, one of the great early leaders in the lab’s history who understood how to foster a community of innovation. William O. Baker was a very rare person indeed. People who want to know more about Dr. Baker’s life and accomplishments can visit Dr. A. Michael Noll’s excellent website by clicking www.williamobaker.org – I particularly recommend reading Dr. Baker’s speech of May 13, 1993. For further reading on the history of Bell Labs see “Bell Labs Memoirs: Voices of Innovation” edited by A. Michael Noll and Michael Geselowitz.